Lord Sudeley had planned to organise a conference regarding Toddington Manor, the estate of his family that is now owned by the artist Damien Hirst. As I had lots of experience with event organisation, we decided to make meetings happen at the House of Lords. At that time, a few of us had come together under the banner of a Campaign for Interest-Free Money. But I also had noticed that ‘interest-free’ ruffled too many feathers. And given my experience as the founder of the first LETS (Local Exchange Trading System) in London as the Green Money Network, I wanted ‘currencies’ to be part of the name. Donald Martin who was introduced to me as someone hated by the banks, said ‘if we put stable in, we have the Bank of England on our side’. Peter Challen suggested the term ‘Forum’. And thus we came together as the Forum for Stable Currencies and thanks to Lord Sudeley I learned about submitting Questions with Written Answers as a first political tool. At first we attended the Select Committee on the Monetary Policy Committee (MPC) of the Bank of England which was established in 1998 and produced reports in 1998, 1999 and 2001. Its purpose was to provide a mechanism for parliamentary scrutiny of the work of the MPC, in line with the Government’s commitment to more open and accountable decision-making on monetary policy. I made the first submission as the mathematician, inventor and software designer enchanted by the new forecasting method that I had devised. The topic was “The State of the Economy and Economic Policy – Long Term and Short Term”. The second submission was to the Committee’s report on Globalisation in the name of the Forum for Stable Currencies. Austin Michell MP had been a sponsor of the Christian Council for Monetary Justice and was one of the few Parliamentarians aware of not only the victims in his constituency but also the many-levelled causes of ‘the system’. Hence he was the first to table Using the Public Credit as an Early Day Motion (EDM). EDMs are formatl motions submitted fro debate in the House of Commons. However, very few EDMs are actually debated. Instead, they are used for reasons such as publicising the views of individual MPs, drawing attention to speciric events or campaigns, and demonstrating the extent of parliamentary support for a particular cause of point of view. Our first EDM attracted 25 signatures from the Labour Party, the Lib Dems and Plaid Cymru. It was the first of a total of nine motions that we tabled between June 2002 and April 2008. Barbara Panvel wrote a document that summarizes the key points of our EDMs on the occasion of the Attwood Award that she created. 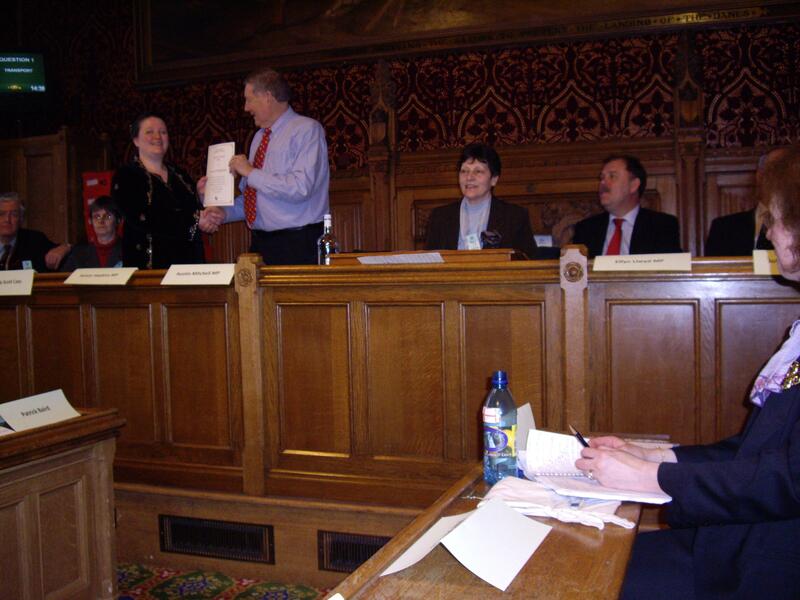 In April 2008 it was given to Austin Mitchell MP. Ever since my web hosting company was taken over by another one, I can’t update that site any more. However, it is extensive as a reflection of the many attempts we tried to make a difference, to educate Parliamentarians and to network across parties, religions and social classes. We had the best speakers internationally and nationally – covering all aspects of monetary, financial and economic aspects – from causes to effects, legal aspects to ‘bank victims’. Our last speaker was Aubrey Meyer to bring the immediacy of climate change home. From our monetary perspective, his concept of Contraction & Convergence has become necessary because there is always enough money for war, but never for education and the environment. It thus needs to be matched by Sovereignty & Seignorage on the level of nation states and national currencies. On the occasion of launching his book Creating a World without Poverty – Social Business and the Future of Capitalism, Dr. Yunus was scheduled to come to London to talk at the London School of Economics and in Bristol. After I was given a complimentary copy by attending the World Entrepreneurship Summit, I was so inspired that I did my best to secure Saturday afternoon in his diary for an event at St. James’s Church Piccadilly. A shortened video is available as an account and the blog illustrates what is happening in the name of Muhammad Yunus, Grameen and microcredit and what is possible if we take Dr. Yunus’ definition of ‘social business’ seriously. However, the Wikipedia entry on social business illustrates how the language gets hijacked: ‘social enterprise’ is used for companies not only in the real economy but also in the financial economy to justify making money out of money. Without any reference to Islam where usury is a deathly sin, Dr. Yunus’ book”Creating a World without Poverty – Social Business and the Future of Capitalism” paints an excellent picture for entrepreneurs to make a difference where institutions and governments have let us down. Reading that book re-inspired me not only to more commitment to monetary and financial causes, but also to make an even happen to make the book known to a wider audience. This included the blog YunuSphere and Wikipedia entries on social business and usury. Parliament is about law making. Creating a national currency is the privilege of a Nation State. When unaccountable Central Banks and banks create more national currency than the State, one has to stop and think. So we talked to a human rights lawyer who advised us to “go for Parliamentary scrutiny via the Treasury Select Committee”. Fortuitously, the Committe was just inviting evidence for submission in response to the Stern Review on climate change. This was the title of our first submission which was published one year after the deadline for submissions. Based on the statistics of the Bank of England, it demonstrates not only the shift of financial power from Government to the City but also from state-issued Cash to bank-issued Credit. Instead of being invited to give oral evidence, we were invited to submit another memorandum which was not published. While the Green Credit report focusses on the state’s supposed necessity to borrow money, this short document elaborates on the use of funding green projects as a carrot rather than taxation as a stick. Another short document was a response to a Call for Concepts by UNEP on the occasion of the Bali conference. An idea opportunity, but another occasion for discovering ignorance and incredulity about the subject.